Our remote systems start with a 5,000v pulse-rated, position-oriented, mogul socket - the highest rating of any socket on the market. Socket is mounted on our patented All System™ cylinder and mounting disc, which adjusts each bulb for maximum reflectivity. Then, we add our new, molded right-angle strain relief and 15 feet of heavy duty, 600v-rated, cable standard to our patented, waterproof Lock & Seal™ Plug System. Patented in the U.S., foreign patents pending. GLECRFKIT GLEC Reflector Adaptor Kit Attaches to the GLX and GLXII reflectors for attached and remote applications. Leviton mogul for universal lamps only. GLECRFKITL GLEC Reflector Adaptor Kit Attaches to the GLS, GLX, and GLXII reflectors for attached and remote applications. Mogul for universal and horizontal positioned lamps. CSXCORD5 5' Lock & Seal™ Lamp Cord Extension Connects the ballast to the reflector with remote applications ONLY. CSXCORD 15' Lock & Seal™ Lamp Cord Extension Connects the ballast to the reflector with remote applications ONLY. CSXCORD25 25' Lock & Seal™ Lamp Cord Extension Connects the ballast to the reflector with remote applications ONLY. CSPOM6KV Socket POM 6KV, Yellow Pulse rated replacement socket will accommodate all lamps including 1000 watt sodium lamps and all positioned-oriented mogul base lamps. CS53501 All System Cord Set, 15 ft.
All System Cord Set, 25 ft. Used with remote systems for 15-25' distances between ballast and early generation reflectors. The all-in-one design works with all ballast wattages. No external reflector brackets required. 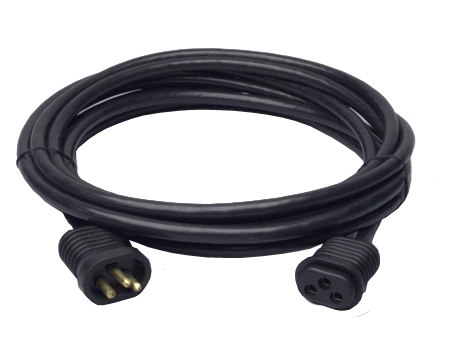 BACORD Heavy Duty 120v Cord, 8 ft Hardwire 14/3, 5-15P 120v heavy duty 8' power cord connects ballast, fans, or other electrical devices. BACD3 Heavy Duty 240v Cord, 8 ft Hardwire 240v, heavy-duty 8' Nema, 6-15P power cord connects ballasts, fans, or other 240v electrical devices. BACD4 Heavy Duty 277v Cord, 8 ft. Hardwire 277v, heavy-duty 8' Nema, L7-15P power cird connects ballasts, fans, or other 277v electrical devices.